One way to assess students is through rubrics. Rubrics tell students exactly how they will be graded and therefore, exactly what they need to do. Rubrics can also be used by the teacher to evaluate student growth or achievement on a particular skill. If a teacher wanted to assess their teaching or lesson planning, there are rubrics for that too. Rubrics are about quality: quality learning and quality teaching. You can use Rubistar to create rubrics. This is a great starting place and the tool I normally use. Rubistar has over 50 customizable rubrics. The process is quick and easy. Below are a few screen shots with captions the explain the features. Made with Rubistar. Semi-customizable. I was able to choose the categories I wanted to include. Criteria was automatically plugged in based on my choices. Also found on Rubistar. This was a pre-made rubric created by another teacher. It’s an option, but the likelihood of it matching exactly what you need is small. Another good site for rubrics is TeAch-nology. This link will take you to 26 pre-made rubrics. You can also customize your own. 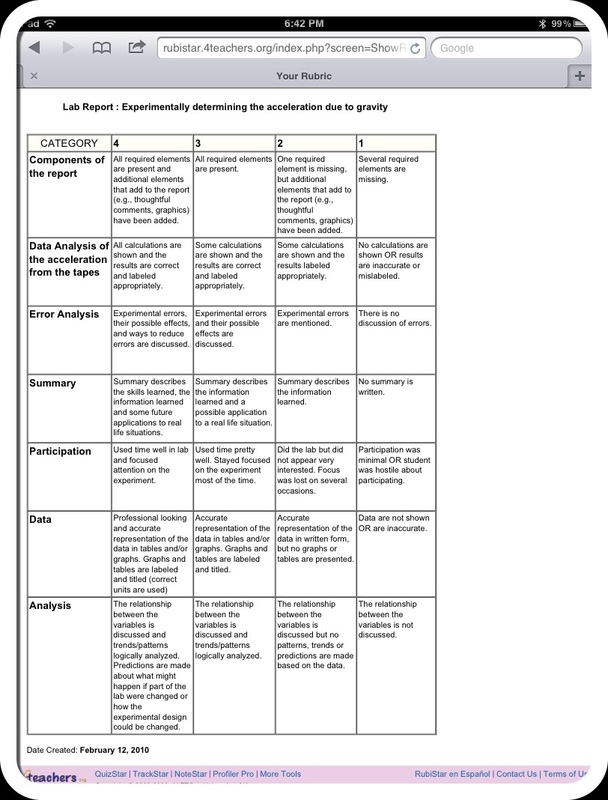 An example of a pre-made rubric from TeAch-nology. All I had to enter was the school name, project name, and teacher. Once you are familiar with the content and layout of a rubric, making one in Word may be just as easy, especially if you are just changing a few things. I have included a few sample rubrics below for you to download and tinker with. The rubric should be passed out with the assignment. Explain the rubric to your students. Ideally, students need to hang onto the rubric and turn it in with the final product. Be prepared: have extra copies on hand. Have students evaluate their work with the rubric before turning it in. I remember rubrics! My school system used essay rubrics from elementary school all the way up to… 8th grade, I think. It may be true that rubrics are about quality, and that they’re good for evaluating student growth and achievement. But as a student, I remember feeling almost offended that all my work was being judged based on a little box. I remember feeling trivialized because my essays were reduced to 4’s and 5’s and 6’s. Consequently, I didn’t like the rubric system very much. Maybe it’s good for math exercises or something of the sort, but for essays and other subjective/creative assignments, I think a more active, critical approach should be used. Thank you for sharing your opinion. I understand what you are saying and agree there is a time and place and situation for different kinds of grading. I do always include a little note on rubrics too.